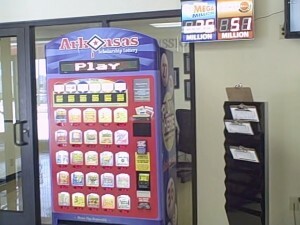 Lottery vending machines have been popping up in Arkansas. First, these vending machines were installed in gas stations like Love’s Travel Center. Next, lottery vending machines will also be found in Kroger stores. The people of Arkansas are having mixed reactions regarding these vending machines. Some are happy about it and some are not. The new vending machines’ proceeds will go to the funding of the state’s scholoarships. Ned Crawford, a shopper, said that these lottery vending machines are a good thing because it will generate enough money for the education of students. According to Representative Barry Hyde, the commission on lottery has already estimated that the vending machines will accumulate a net total of $5 million annually. Previously, a ban on vending machines had been proposed, however it was not approved. Now, a total of a hundred lottery vending machines are being installed all over the state. Currently, the largest retail store that will have the vending machines is Kroger. The machines will be installed at 33 of Kroger’s stores. Prior to this, Kroger’s had already been selling lottery tickets the conventional way. That is, a person was in charge of selling the lottery tickets. The rest of the vending machines will be installed in several other locations in Arkansas. To prevent minors from purchasing lottery tickets in the vending machine, the machine asks the buyer to swipe his driver’s license first before proceeding with the transaction. Currently, every person who plans to buy a lottery ticket from the vending machine goes through a clerk inspection, as well as the security checks. Although it has been confirmed that Kroger will have these vending machines, the company has not announced when the machines will be up and running in their stores. Thanks for sharing the information. Now I will be able to buy lottery tickets through vending machines from grocery stores.